This data set describes monthly rainfall distribution statistics over the whole African continent, including Madagascar. The rainfall estimates are taken from the NASA Tropical Rainfall Measuring Mission (TRMM) data between 1998 and 2012. These statistics were quantified using a gamma-based function and two Markov chain parameters with the aim to reduce the information on rainfall to a small number of parameters and process for various applications. These summary statistics are suitable for temporal downscaling. This data set provides gridded (0.25 x 0.25-degree) estimates of 14-year mean monthly rainfall total amount (mm), frequency (count), intensity (mm/hr), and duration (hrs) of rainfall, as well as Markov chain and gamma-distribution parameters. The data are presented as a series of 12 netCDF (*.nc) files. Figure 1. Mean monthly total rainfall amount (mm) for the month of December. 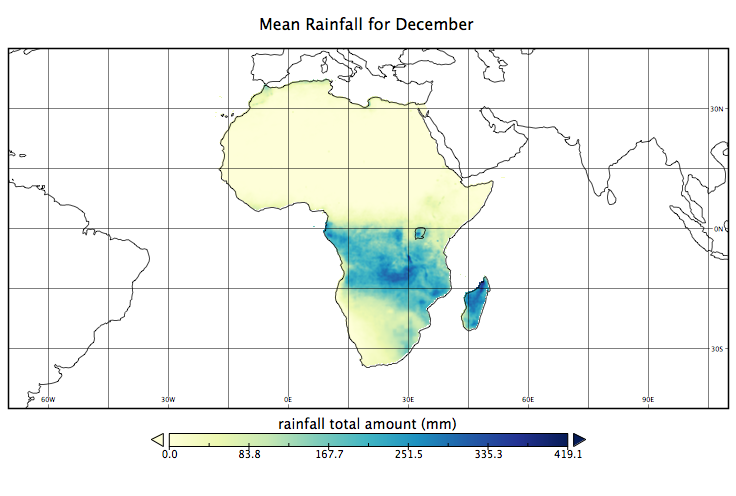 This data set provides an example R script (read_rainfall_stat.R) that can be used to access monthly statistics and implement down-scaling using archival (or projected) monthly rainfall estimates. Grid cells at 0.25-degree resolution. The data represent the mean monthly values over the period 1998-01-01 to 2012-12-31. Monthly (1-12), representing the accumulation of precipitation at the end of each month. Data are presented as 12 netCDF files (*.nc) (Table 1). Grid cells with no data (fill value or missing values) are represented by “-1”. An understanding of rainfall characteristics at multiple spatiotemporal scales is of great importance for hydrological, biogeochemical and land surface modeling studies. This data set provides analysis of rainfall for 1998-2012 and summarizes these data using gamma probability density functions. Assuming stationarity, gamma probability density functions of the total depth of 3-hourly and daily events can be used for temporal downscaling of monthly rainfall estimates (past or future). Kaptue et al. (2015) generated 3-hourly and daily rainfall estimates that are pixel-wise statistically indistinguishable from the 1998-2012 observations while preserving monthly totals. This data set could also be used as a baseline in the assessment of rainfall from atmospheric models. Sources of uncertainty in the data set include: error and uncertainty inherent in the TRMM data set and the definition of rain events. The definition of a rainy day is conventionally based on a constant threshold. If the threshold is set too low, there will be many specious data retained for the analysis while if the threshold is too high, there will be only few events left for analysis and the results may be highly sensitive to the depths recorded in such few events. The fixed thresholds for daily (≥ 1 mm/day) and 3-hourly (>0 mm/hr) precipitation events used in this study are not necessarily meaningful for all modeling purposes of African climates. This data set was derived from Tropical Rainfall Measuring Mission (TRMM 3B42v.7) data at 0.25-degree x 0.25-degree grid size and 3-hour sampling frequency for the 1998-2012 period. Although rainfall intensity varies at all temporal scales, TRMM 3B42 provides mean rain rates over each non-overlapping 3-hour period. After defining a rainy day as a day with a minimum precipitation depth of 1.0 mm and a rainy 3-hour period as a 3-hour period with a non-zero precipitation depth, the investigators estimated for each of the 12 calendar months multi-year monthly averages of: (i) the rainfall amount (mm) defined as the total amount of rainfall accumulated within a month, (ii) the rainfall frequency (number) defined as the number of rainy days within a month, (iii) the rainfall duration (hr) defined as the number of 3-hourly events in a rainy day multiplied by three and (iv) the rainfall rate (“intensity”; mm/hr) defined as the ratio of the total rain depth in a daily event to the duration of the event. Per-pixel correlations between monthly time series (number of rainy months x 15 years) of these rain event properties were then estimated. Temporal correlations of the occurrence of daily and 3-hourly events were modeled using a first-order Markov chain. A first order Markov chain can be fully defined by the transition probability of a wet period to a wet period (w) and the transition probability of a dry period to a wet period (d). We estimated transition probabilities by computing the conditional relative frequencies. The statistical distribution of the total depth of daily/3-hourly events was also investigated using the gamma probability density function (PDF). The shape (α) and scale (β) parameters of the gamma distribution were obtained as maximum likelihood estimates using the statistical software R. The parameters (α, β, w and d) of daily and 3-hourly events were computed separately for each of the 12 calendar months. Rainfall statistics were calculated for each month of the year. A full description of the procedure and analyses of results are provided in Kaptue et al. (2015). Kaptue, A.T., N.P. Hanan, L.Prihodko, and J.A. Ramirez. 2015. Spatial and temporal characteristics of rainfall in Africa: summary statistics for temporal down-scaling. Article in press at Water Resources Research.